After following the exploits of The Kindness Club from Chloe's point of view in Chloe on the Bright Side, we switch to Lucy's side of the story. Lucy is struggling a bit at home; her older brother Ollie is off at college, her grandmother is oddly over scheduled, and her father is either working or distracted when he is home. Her mother died when she was very young, so she doesn't really miss her. In addition to working at the community center on a quilt with some of the younger children, the club is looking for other projects. When Lucy finds out that a classmate's mother just died, and that Serena and her mother always made a big deal out of birthdays, Lucy starts a project to plan a surprise party at her father's bowling alley for Serena. She does check with Serena's aunt, and asks around to find out who her friends are to invite, but her planning otherwise lacks some focus; for instance, she does not ask her father if she can have the party at the bowling alley! When Lucy realizes that she can't have the party there, she does manage to relocate it, but then hears from Serena herself that it's too soon to be celebrating. Crushed, Lucy talks to her neighbor, Mrs. G., and the two retrieve some of Serena's mother's clothing from the local thrift store and make a quilt for Serena instead. Lucy finds out that her father's business is struggling, but will be okay, with some modifications. Strengths: There are some good details about how to help someone who is grieving. Serena dislikes the "dead mother look" that she feels teachers are giving her, and feels that the birthday party is motivated out of the same sense of pity, even though Lucy has also lost her mother. The fact that Lucy's grandmother and father are trying hard to keep the family afloat amidst difficult economic times is handled very nicely. For example, their dishwasher quits working, and it is not a priority to fix. 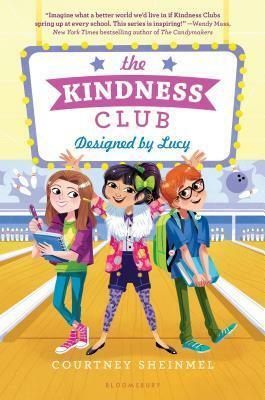 The idea of a kindness club is a nice one, and this book is generally upbeat. Weaknesses: There are two dead mothers in this one, and we don't see as much of Chloe, whose family story bears further examination. Theo pops in only to spout trivia; I'll be interested to see if a third book in the series sheds some more light on his character. What I really think: A solid middle grade title for readers who like realistic fiction.